We are a free, public charter K-12 school with a very involved and supportive parent community that includes experts in science, technology, engineering and math. Our students frequently claim state and regional championships in competitions such as the Science Olympiad, Math Counts and state Spelling Bee. Paragon Science Academy provides a rigorous, college prep, STEM-focused education through a challenging, comprehensive curriculum, continuous assessment, and dedicated teachers,inspiring students to become the leaders of tomorrow. We emphasize a scientific approach, hands-on work, computer literacy and the ability of students to use data and articulate a thesis. We participate in statewide and national math Olympiads and competitions, and emphasize skill-level education with individualized instruction. Our staff is multicultural, and is caring and supportive of students and parents. Our staff members frequently provide their personal contact information and time to assist our students. Our instructional staff includes a Gifted specialist, English language learner coordinator, reading specialist, school psychologist, Special Education coordinator, speech therapist, and tutors. Sports include PE classes, soccer and volleyball. The teachers try to identify the strengths and weaknesses of the individual student to provide them the best curriculum or place them into the right level of lectures. The teachers are all very vested in the success of the children. When my son was having problems with some of the material he received extra tutoring that helped him expand his skills. The administration keeps an open line of communication and they are very responsive to questions or concerns. My son is a first grader. He has incredibly improved in all areas since August. The class size is perfect. He loves going to school because the whole environment is very easy-going, diverse and friendly. 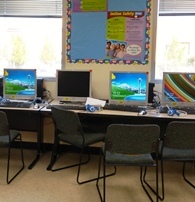 The school lets the kids accelerate at their own level. Teacher resumes are available for inspection in the Front Office.